Grab your copy now from one of these retailers – Kindle edition now available! Play video for more information! Cyberspace is an informative, fun, and educational place for the entire family, but danger lurks everywhere you turn online. From phishing to cyber bullying to identify theft, there are a myriad of ways that you and your loved ones could be harmed online, often with irreparable damage. Fortunately, there are precautions that everyone can take to protect themselves, their families, and their businesses that don’t require advanced (or even any) technical knowledge. 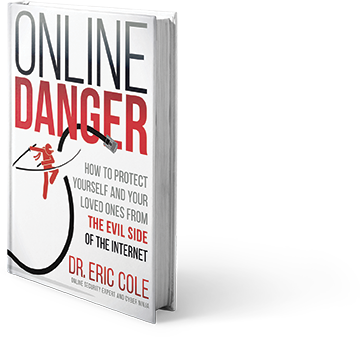 In this book, cyber security expert, Dr. Eric Cole, provides a layman’s look at how to protect yourself online. 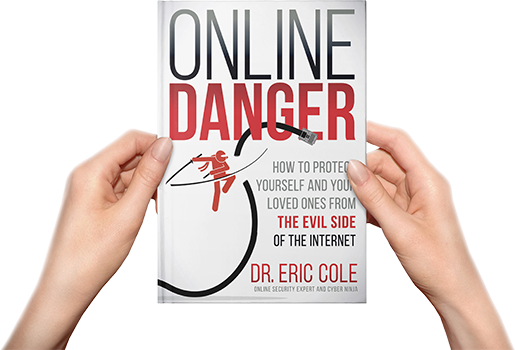 Online Danger: How to Protect Yourself and Your Loved Ones from the Evil Side of the Internet applies to organizations as well as individuals, and across professions. Doctors, lawyers, and teachers – anyone responsible for safeguarding a client’s or student’s data – will learn something they can use right away. Whether you’re a parent wanting to know how to keep your children safe as they use the Internet, or a senior citizen who doesn’t want to fall prey to an online scammer, or a daily technology user who wants to learn more about how to protect themselves in cyberspace, this book is for you. You get ten chapters packed with easy-to-understand and practical advice from a renowned cyber security expert. Dr. Cole makes the case that everyone is a potential target, not just the rich and famous, and he explains in plain language how to make your computer safer, protect your email, and guard your online accounts. Chapter 1: Tips on first steps to make your Internet experience secure. Chapter 2: Tips on developing cyber sense and how to safely dispose of devices. Chapter 3: Tips on developing awareness and avoiding scams. Chapter 4: Tips on thwarting viruses and other cyber attacks. Chapter 5: Tips on creating strong (and memorable) passwords, guarding financial accounts, and more. Chapter 6: Tips on using social media, backup, encryption, and cloud storage. Chapter 7: Tips on proper social media etiquette and safety for kids. Chapter 8: Tips on staying secure as new technology moves off the desktop and into everyday activities. Chapter 9: Tips to reduce your risk in cyberspace and minimize the impact of a compromise. Chapter 10: A complete road map with best practices for most online activities and behaviors. I’m in my late eighties and in one more month I’ll be 89. I’m now retired after spending 35 years with a Fortune 500 company. The last fifteen years helping to establish an Information Security program. I’m very interested to see the work you’ve done in today’s world. Good luck. Could you extend a personal thank you to Eric from myself, as I’ve found his webinars and books super helpful in growing my knowledge in the cyber security industry over the past 12 months. I’d be lost without them! After reading Online Danger, I am way more aware of how easy it is to get scammed, tricked, or attacked by online adversaries. That’s scary, but good, because it’s that awareness that will keep people safe. I’m giving this book to my 85 year-old mother — she hasn’t been on the Internet very long, and I think it will help her a lot. My daughter gave me this book, and it was a quick but important read. 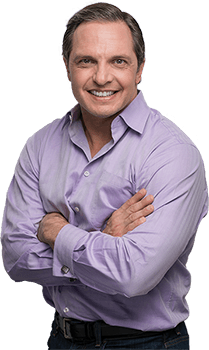 I felt an immediate connection with Eric (I’m old enough to be his mother, too) because of his friendly, straightforward style. I learned a lot and saw some things I was doing wrong. This is a great source of information for seniors.